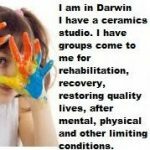 Have Enjoyed the art of ceramics for over a decade Completed Authorised Duncan Teacher qualifications Opened own studio 2012 in Palmerston NT In 2014 I became a Professional Life Coach and Meta Dynamics Practitioner in the space of relaxation people open up about how life is. I went one step futher so I could add value to the lives of the amazing people I come in contact with. Here I support everyone in a safe place of relaxation to recover, rehabilitate and restore a creative quality life. I knew it was going to be a challenge opening a business but didn’t know studio customers can be plentiful then few. 2013 and some many of us are living such rushed lives. I started classes in February, after starting a Artfit Boot camp which motivated me to start improving on my life and fitness. Ive had a personality profile done and achieved a greater understanding for my reluctance for change. 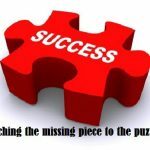 With this awareness I have acknowledged I’m exactly where I want to be – with the people I want to be with and I appreciate that I am surrounded by the different personalities that make up my growing amazing world. Through this ARTfit program my body grows stronger, my mind becomes more aware and my career has taken an about face. Whilst still keeping my current employment, my love for ceramics has pushed forward and now I am making it my current main goal. This is my first blog, where to start…. I had this idea pop into my head about seven years ago that I wanted to open my own Hobby Ceramics home based business. What a path my family and I have travelled since. I had attended ceramic classes until the local ceramists decided to close down. I missed ceramics so much. It was my stress free down time, as a mum of three and working, it was also my social life. I did’nt know what else to do as ceramics IS my passion. I have found ceramics to be challenging, relaxing and FUN. I have created some very priceless pieces to ME. I have let even the simplest design lead me to creativity.